Centre for Childrens' Happiness (GTE) Ltd | ..for the positive childhood everywhere..
Work: Development work at the newly built children’s center, organize language classes for the children in the village. Qualification: Volunteers who understand and respect the culture while dedicated for hard working. Casual visitors and ‘holiday makers’ would NOT be entertained. If you are interested to participate, please confirm your participation to Kajen at 0772658002 before 03rd of December 2014. We will select the volunteers based on first come first save basis since we have only 15 vacancies for the work camp. Selected children who are unable to continue their education, were assisted by providing needed educational materials at CCH. Centre for Children’s Happiness collected the detail of needed families. 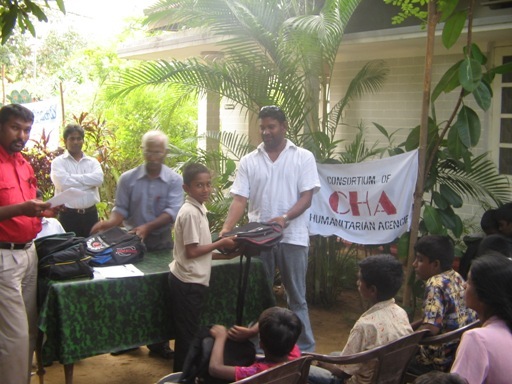 The distribution event was held on 6th March, and it was enabled with the financial support of CHA. There are 58 children were provided materials. Head of UNDP Jaffna Mr. K.V Nishanthan and Mr. Kayavinthan, head of Psychology Department, University of Jaffna participated at the even for a motivational session. CCH-Jaffna provides multi-disciplinary services related to psychological wellbeing and personality development that are flexible and meet the needs of young children and their families through forming child – friendly atmosphere necessary for the healthy growth of the children and taking and introducing such atmospheres and the concept at village level.